Injectable Wrinkle Relaxers: What’s the difference between Botox, Dysport & Xeomin? The injection of botulinum toxin, commonly known as Botox or botox-type, injectables have become very popular in the effort to reduce wrinkles and rejuvenate an aging face. Moreso, wrinkle relaxing injectables have become popular in preventing wrinkles before they happen. This type of injectable is even FDA approved for additional treatments such as hyperhidrosis and has been found to be helpful for migraine treatment. Are all Wrinkle Relaxers the Same? Yes & no. Botox is, by far, the most popular & known neurotoxin. FDA approved in 2002, more than 4 million injections have been performed. 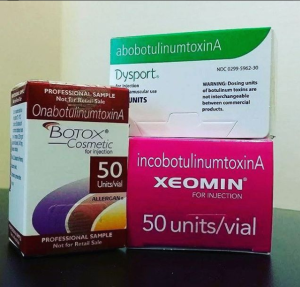 Dysport & Xeomin became available later and both have the primary active ingredient, botulinum toxin type A. Other ingredients and strengths of the primary ingredient can affect the way the injectable works for each patient & the length of time. Pricing and customer loyalty programs also may be a factor in choosing which injectable is right for you.